"And what am I to do? Just tell me what I supposed to say? I can't change the world. But I can change the world in me when I rejoice." 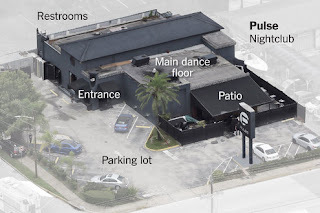 A few days ago there was a horrific mass shooting at gay dance club in Florida. While committing the atrocity, the gunman called 911 and pledged his allegiance to ISIS. Needless to say, politicians tried to make hay out of it. In particular, Donald Trump renewed his call for a ban on all muslims from even visiting the county. He then essentially asked the American people if they feel safer today than they did eight years ago. Yes. I feel perfectly safe. I buy my gas from a nearby B.P. station owned by Ali, a Shiite from Lebanon. From time to time I shop at a "Halal" market next to the Somali (Sunni) mosque a half a mile from my house. I feel perfectly safe. I also feel safe around my Jewish friends, my agnostic & atheist friends, my Australian, British, German, Hmong, Vietnamese (Buddhist), and Canadian friends. I don't think I know any Hindus, but I feel perfectly safe around Curry & Tika Masala. To be perfectly honest & blunt, about the only people I get nervous & itchy around are my fellow "Christians." (It's a LONG story) I get a lot of red flags off of those folks. I also get suspicious of people from Wisconsin and other Packers fans. This event was a horrific tragedy, but the response has been a national absurdity in many respects. For starters, this appears to have little to do with Islam, except to act as a fig leaf for a crazy man. The FBI had dismissed him earlier because he had talked about being tied to Al-quaeda, Hezbollah AND The Nusra Front. (Three organizations that all hate and try to kill each other.) Now it just might be that the killer was simply a self-loathing, gay man who couldn't handle that. Now Trump talks about banning families & relatives just to be on the safe side. To be on the safe side, he should probably deport me, too. My grandfather was from Norway, and I still have relatives over there. Back in 2011, Anders Breivik slaughtered 70 people at a Norwegian youth camp. To quote Aragorn, "That same blood flows in my veins...that same weakness." Americans love their fear. We do. So does the church in America. Personally, I think that's the biggest problem that the church in America has. Fear. We fear modern science. We fear muslims. We fear the government. We fear christians who ask questions. We fear the "other." Jesus wasn't big on fear. He used versions of the phrase "Don't be afraid" quite a bit to his followers and disciples. Paul didn't seem to be big on fear either. He didn't seem to have any problem telling truth to power. After the reinstatement of Peter, Pete didn't seem to be big on fear. In fact, Jesus actually put the proper use of fear in perspective; "Do not be afraid of those who kill the body but cannot kill the soul. Rather, be afraid of the One who can destroy both soul and body in hell." (Matt. 10:28) So if you are in Christ, and Christ is in you...what is there to fear? Two days ago, I got together with a friend named Dan that I hadn't seen in a while. We were talking about the state of christianity in this country. We joked that so many christians need to have a tiny god that they can reduce to a formula on a piece of paper. A little god that can be throughly understood and controlled. If we are informed that the God of the bible is quite a bit bigger than that we get scared & nervous. for there is no other name under heaven given to men by which we must be saved." Dan & I agreed on the above. At this point in our lives, that's all we really know. Jesus is the resurrected King. The creator God of the universe. The only hope for human salvation. After that, I'm open for discussion. I'm not afraid of questions or debating things. I'm not afraid of modern science and it's discoveries. I'm not afraid of what archeologists find. I'm not afraid of scholarly debates on the bible & theology. As mentioned above, I'm not afraid of my muslim neighbors, either. Nor am I afraid of gay people. I need more gay friends. I have no fashion sense, so they are very handy to shop with. I am not afraid of cross-dressers. Although no one is ever going to stop me from laughing hysterically...on the inside. I'm not afraid of Indians. (Dots, not feathers) I need tech support from time to time. I am not afraid of Jews. Where would the state of American humor be without them? I am not afraid of Italians. Bada-bing, bada-boom! I am not afraid of Atheists. Where would existential philosophy be without them? I am not afraid of the Irish...dirty, potato grubbing Micks with their Guinness beer. I am not afraid of people from California. "Su'p Bruh." I am not afraid of people from Iowa. They have been punished enough. I am not afraid of raging Pentecostals. Benny Hinn & Kenneth Copeland make me thankful I am not them. I am not afraid of Canadians. Although I do believe that their inherent politeness masks a deep seeded berserker rage that spills forth whenever hockey is played or poutine is consumed. Statistically, if you want to fear anyone in the U.S., it should probably be white males. It was said that the shooting at the Pulse night club the other day, was the biggest mass shooting in U.S. history. That's not true. In 1890, the U.S. cavalry shot anywhere from 150 to 300 Lakota people dead at Wounded Knee in S. Dakota. That's the biggest mass shooting in our history. 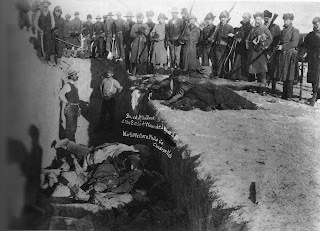 The FBI estimates that from the end of the civil war through the end of the Civil Rights movement, over 5000 black men were lynched in this country, by white males...all good christians from there bible belt, ya know. Talk about your domestic terrorism. All of this in our "Christian Nation." This past winter, Ammon Bundy's crazy offspring and their goofy friends took over a national park in Oregon to keep the government at bay. They claimed God had told them to do it. I have some very good reasons to be nervous around my fellow believers and anyone who calls themselves a "Christian." Still, at the end of the day, I can't say that I have much in the way of fear. It's true that I don't have the energy for it. But also, I know who my God is. I'm probably one of the most unfaithful, selfish, ungrateful followers of Jesus that you'll ever meets. So I'm thankful that it's his faithfulness that matters. and he's told me that he has me. Want to know what I actually AM afraid of? Strawberries with hair on them.